Crazy Climber (クレイジークライマー, Kureijī Kuraimā) is a coin-operated arcade game produced by Nichibutsu in 1980. It was also released in North America by Taito America by UA Ltd. in 1982 for the Emerson Arcadia 2001 and other video game consoles. It is one of Nichibutsu's most highly acclaimed video games in its library. A precursor to the platform game genre, Crazy Climber was the first video game revolving around climbing, specifically climbing buildings, before Nintendo's 1981 release Donkey Kong. The game was ported to the Atari 2600, Arcadia 2001, Famicom, and Sharp X68000. Windows that open and close (the most common danger). Bald-headed residents (a.k.a. Mad Doctors), who throw objects such as flower pots, buckets of water and fruit in an effort to knock the climber off the building (with larger objects appearing by more aggressive Mad Doctors in later levels). A giant condor, who drops eggs and excrement aimed at the climber (two at a time in the early stages, four in later levels). A giant ape (styled like King Kong), whose punch can prove deadly (he becomes more aggressive in later levels). Falling steel girders and iron dumbbells (more numerous in the later levels). Live wires, which protrude off electric 'Nichibutsu' signs. Some of these dangers appear at every level of the game; others make appearances only in later stages. Should the climber succumb to any one of these dangers, a new climber takes his place at the exact point where he fell; the last major danger is eliminated. One ally the climber has is a pink "Lucky Balloon"; if he is able to grab it, the climber is transported up 8 stories to a window. The window onto which it drops the climber may be about to close. If the window that the climber is dropped onto is fully closed, the balloon pauses there until the window opens up again. The player does not actually earn bonus points for catching the balloon, but he is awarded the normal 'step value' for each of the eight floors that he passes while holding the balloon. If the climber is able to ascend to the top of a skyscraper and grabs the runner of a waiting helicopter, he earns a bonus and is transported to another skyscraper, which presents more dangers than the past. The helicopter would only wait about 30 seconds, then fly off. If the player completes all four skyscrapers, he is taken back to the first skyscraper and the game restarts from the beginning, but the player keeps his score. The difficulty level of any game was modified to take into account the skill of previous players. Hence if a player pushed the high score up to say 250,000 (needed a really good player), any novice player following would get thoroughly wiped out for several games due to the increased difficulty level and would have to play until it dropped back down. Musical cues used throughout the game include "Baby Elephant Walk", "The Pink Panther Theme", and "The Entertainer". If the climber is not moved for several seconds, a voice says "Go for it!" The Family Computer version had a special controller that could be used with it. In 1981, Bandai Electronics manufactured a hand-held VFD version of the game. A Japanese-only sequel, Crazy Climber 2, was produced in 1988. 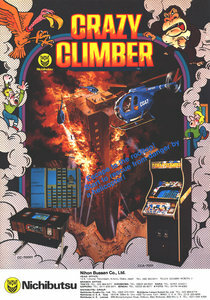 The game was essentially identical to Crazy Climber in gameplay but featured more sophisticated graphics and a few new features. On February 3, 1996, Hyper Crazy Climber was released only in Japan for the PlayStation. It has similar gameplay to that of the original game but also a few differences. Players can choose between three cartooney characters, each with their own strength/speed attributes. Several buildings can be selected from a Bomberman-style map screen, including an underwater building, a medieval clock tower, a haunted skyscraper, and a beanstalk. Power-ups are also used. On March 2, 2000, Crazy Climber 2000 was released for the PlayStation. This is more of a remake of the original arcade game using 3D graphics for the first time. A notable feature is the ability to turn corners and access different sides of the buildings, which now have a variety of designs (including one with a cylindrical, tower-like shape). The game included the original port of the arcade Crazy Climber and a scan of the instruction panel. Like Hyper Crazy Climber which released for the same console 4 years earlier, Crazy Climber 2000 was released only in Japan. On July 21, 2005, Japanese publisher HAMSTER released the arcade version of Crazy Climber under their Oretachi Geasen Zoku Sono (オレたちゲーセン族) classic game line for the PlayStation 2. Another sequel or remake, Crazy Climber Wii was released for the Wii in Japan on December 20, 2007, but no North American or European release has happened. The arcade game was later re-released on the Virtual Console in Japan on February 23, 2010. On February 8, 2018, the game was released for the Nintendo Switch by HAMSTER under their Arcade Archives series. It had been previously released on May 15, 2014, for the Playstation 4 as the very first entry in the series. Crazy Climber at Atari Mania. This page was last edited on 28 March 2019, at 01:06 (UTC).